Leave it to the French to create a sandwich that not only gets better after a long sit (preferably 24 hours), but actually requires a good smashing. This hearty sandwich, packed to the brim with lip-smacking ingredients, is the ultimate picnic food. 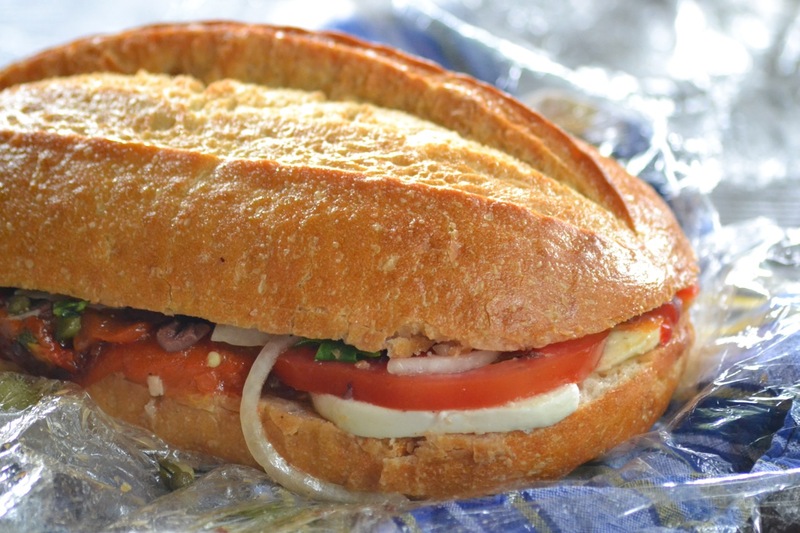 Below you’ll find a recipe full of suggestions for you to make your own pan bagnat. A recipe is hardly necessary though and I encourage you to build this sandwich according to your own tastes and what you have on hand. Pan bagnats traditionally feature tuna fish, but the possibilities are really infinite. Our favorite version was vegetarian. We substituted thick slices of fresh mozzarella for the tuna and happily noshed our way into full belly bliss. Seeking out the best bread you can find is important. Find a sturdy loaf with a good crust. 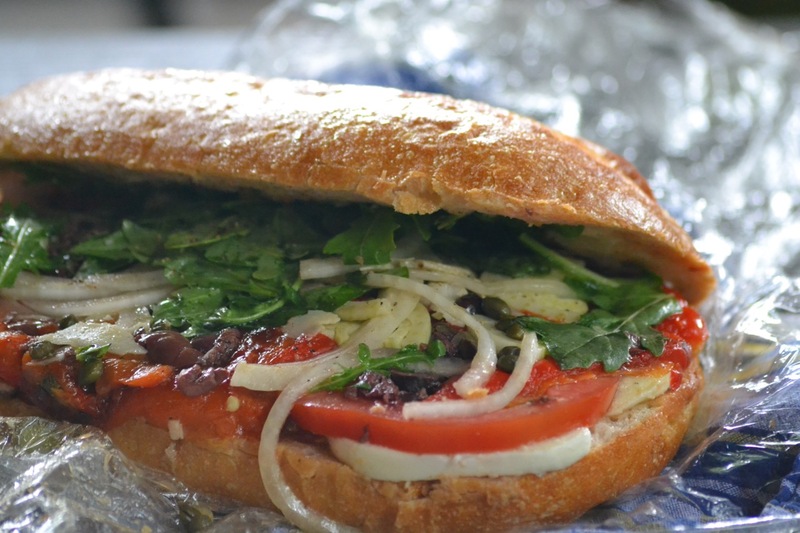 I used a loaf of French bread, but ciabatta would be another good choice. A loaf of sandwich bread is a bad, bad choice. Remember, your sandwich is going to be put through the ringer: first smashed and then left to sit in its own juices overnight. Choose your bread wisely! 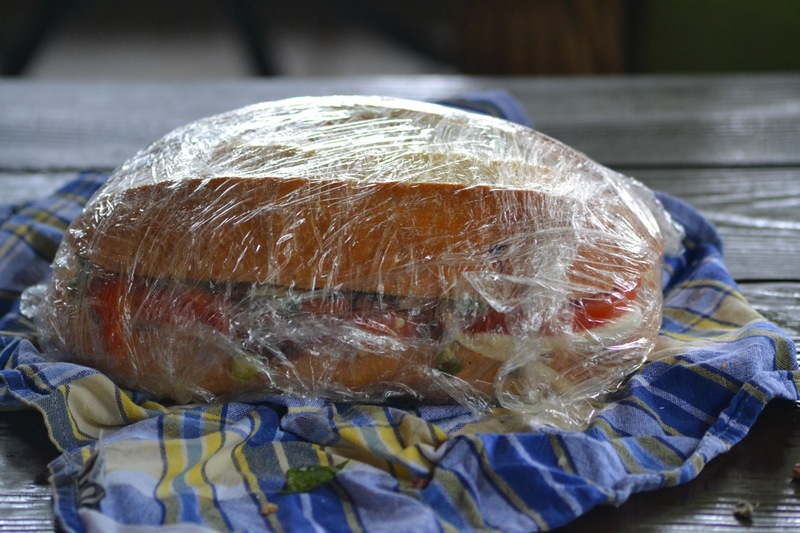 With sandwich made, take the time to pack up your other picnic supplies. Remember a good blanket, a serrated knife for easy cutting, and, of course, the wine and corkscrew. Happy picnicking! The first time I made this I made half a sandwich with canned tuna and the other half with mozzarella to accommodate everyone at a picnic. Both sides were a hit, but my husband and I found the mozzarella version much more satisfying. The beauty of this sandwich is that it benefits from being made ahead and actually requires a good smashing. We served it at a picnic a couple hours after making and it crumbled. After spending the night in the fridge, it sliced beautifully. In short, make this sandwich as far in advance as possible. I don’t specify specific quantities for the ingredients below. Rather use the suggested ingredients as a guide and make the sandwich per your own tastes. Cut the loaf of bread in half lengthwise. If desired, pull out some of the bread from the middle of the loaf. Drizzle the cut sides of the bread generously with olive oil. Spread the tuna and/or mozzarella over one bread half. Sprinkle with red wine vinegar. Add the rest of the ingredients per your individual taste. Season the sandwich generously with salt and freshly ground black pepper. Top the ingredients with the other half of the bread and wrap the entire loaf tightly in plastic wrap. Press down hard on the loaf to smash all of the ingredients together. Wrap a kitchen towel around the plastic wrapped loaf and place in the refrigerator with a heavy bowl or baking sheet atop it. Let sit for at least four hours but preferably overnight. When ready to serve, remove the plastic wrap and cut into thick slices. Serve cold.